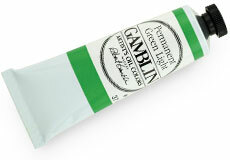 Robert Gamblin proudly presents Gamblin Radiant Colors: eight high-intensity tints - mixtures of pure color and white - at Value 7 on the Munsell System evenly spaced around the color wheel. Using the Radiant tints, painters can build traditional under paintings, then glaze for optical effects of light and shade - enabling painters of today to explore a technique of the past. Using tints (pure color + white), painters can make the brightest paintings. Using shade [pure color + black], painters can make deep, luminous paintings, accenting with white and tints. Using tone [pure color + white + black], painters can build paintings by value of pure light tints and grey. Metallic paint is made of tiny flakes of real metal floating in a clear binder. It's the light reflecting from all those bits of metal that create the "metal finish." But though the microscopic flakes are real metal, they don't line up evenly, so they bounce light around rather than reflecting it directly back at us like a mirror. This is why metallic painted surfaces always have that soft, flat look. The finer the metal flakes and the clearer the binder, the more reflective the surface will be. "What we do is make essences of emotions that are reflected in colors."